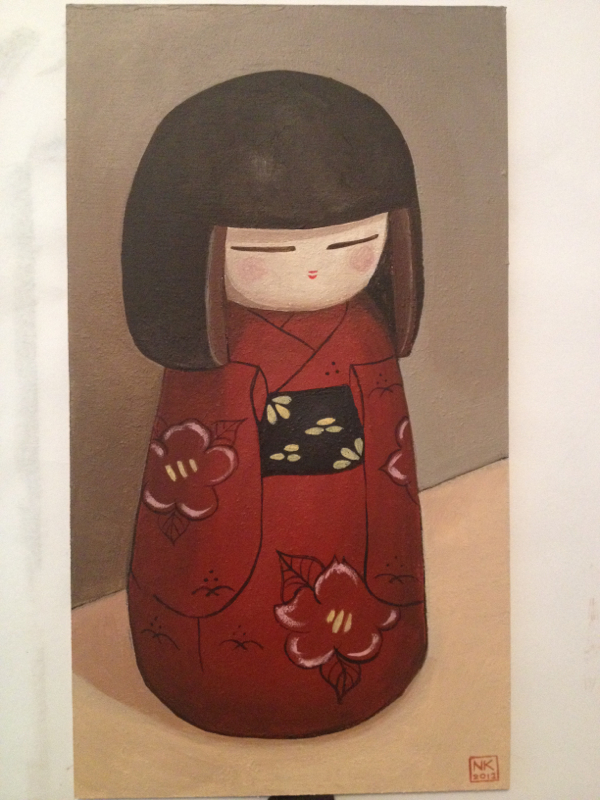 This little painting of a kokeshi doll is my entry for the walker street gallery 9 x 5 art competition. My technique is different to my other kokeshi painting due to a change in paint. I've used this competition as a good way to trial acrylic painting techniques. I probably prefer this one, but it might just be the warm colours that have won me over! Drawing with a 6B pencil. It's only a small sketch, but a good challenge to get all of the varying light shades on this tube of paint. Here is my entry for the Walker St Gallery's 9 x 5 exhibition. It's a great little gallery in Dandenong. ''The original 9 x 5 Exhibition of Impressions was displayed at Buxton’s of Swanston Street, Melbourne in 1889, where the dimensions of a majority of the paintings were nine inches by five inches. Many of the paintings were painted on cigar box lids collected from tobacconists, but just as many were painted on board.'' - Walker St Gallery website. 9 x 5 boards are a much smaller scale than what I usually work on and I wasn't quite sure what to paint originally. 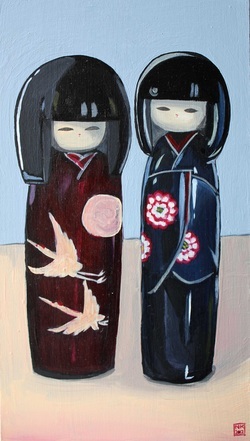 In my house I have a few Japanese Kokeshi dolls which are hand carved out of wood and painted. They are super cute and I thought this size would suit my format. It almost felt like a formal portrait... as they watched me while I painted them. Not sure if that makes it cute or just creepy. I used acrylic paint on a primed board. This is a self portrait I started a while ago and just haven't got around to finishing it. It's quite a big canvas; around 1.5m high. I forgot I painted it and when I found it I decided to put it out, hoping I might be inspired to finish it. Little sketch of an Australian native bird. Colour pencil on pastel paper. My dog, Jazz, makes another appearance. Throughout this year I have been working with The City of Casey to developed a community art project. The first part of this was a series of workshops with youth from the area, teaching the participants how to paint on skateboard decks using acrylic and spray paint. 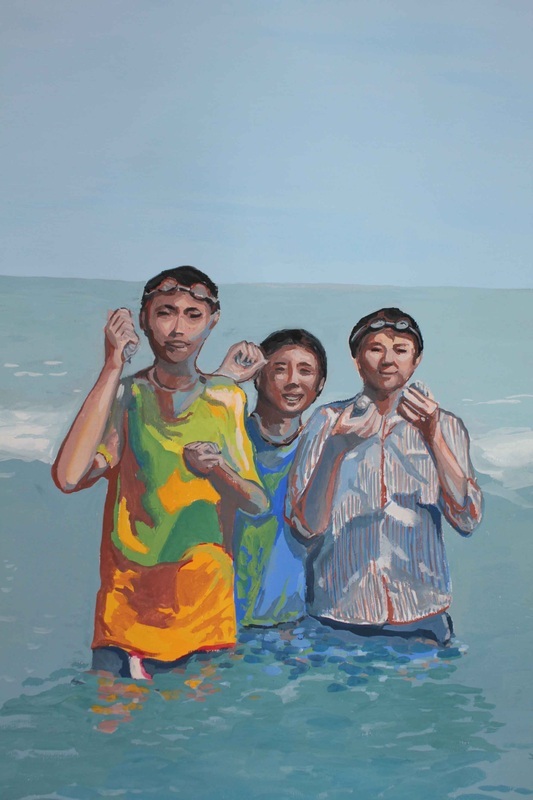 The second part was developing a public art piece which evolved from the workshops. This photo shows the final piece installed on the exterior of the Shed. The piece is stainless steel which was laser cut and installed on the wooden facade. This in itself was a massive project; how does one cut metal and install it upside down on a surface which is over 3 metres high....? With great difficulty! The launch on Friday is the final part of this project. This is a small painting of one of my favourite images; an origami paper crane. I love that one single sheet of paper can be folded to create something so beautiful... and of course the story of 1000 paper cranes is such a powerful story. I was lucky to enough to visit Hiroshima and see literally millions of paper cranes made by people the world over in the Hiroshima Peace Memorial Park. This painting is acrylic on canvas - 32cm x 32cm. These boys were a little obsessed with collecting shells on the beach and were quite proud of their collection. 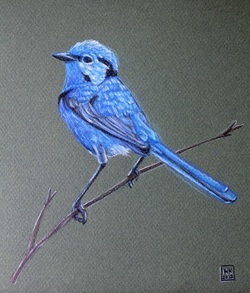 This painting was made using gouache on paper. 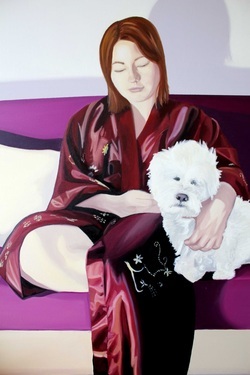 I still don't think it's quite finished, but this is a studio blog so I put up unfinished works as well... I guess whenever I call it finished it can be! Life drawing is one of the biggest challenges and I love the intensity of drawing as much as you can in a limited time frame. Plus you have the added pressure of knowing people will wander around and look at each others work in the break. If that's not enough, the model will also come and check out your work, so I always hope I don't offend them! 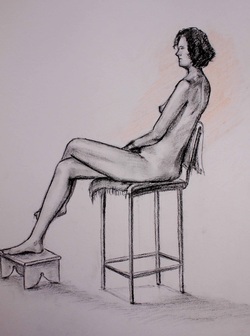 Recently I found an untutored life drawing class (which out in the 'burbs is hard to find!). I am the youngest by about 40 years I think. Their wealth of knowledge is intimidating, but they are very helpful and encouraging which is always nice. Anyway this charcoal pencil drawing is a little on the German Expressionist side, I must have been influenced by the exhib at the NGV!